I was going to post this yesterday but then went and got bangs cut and couldn't see anything. I'm getting used to head tilt/peering out method so here's the dress I made for dolly. 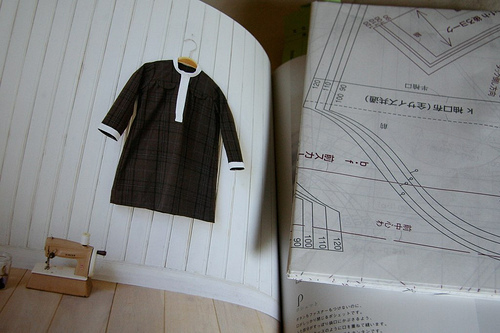 I thought I'd be all clever and copy the pattern from this girl's dress in a Japanese pattern book but yeah, that didn't work. Not the right proportions for Louise at all. Although it does fit Jenny better, she's more realistic. Still I had to redraw the bodice and body and sleeves, which is all the pieces. But it went faster once I gave up on trying to make the front button flap functional like on the girl's dress and just made it decorative. I might cut something else out this afternoon. My daughter had my dolls, My Friend Jenny and My Friend Mandy! My mouth dropped when your blog loaded! Cute little dress for Jenny. You did a great job. My Friend Jenny! Cute dress. 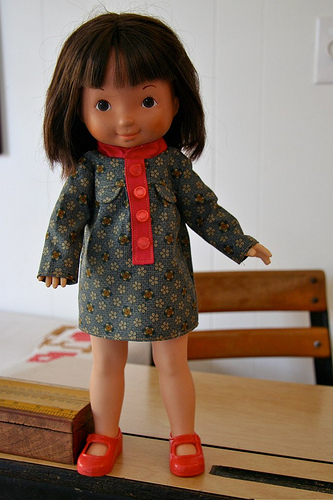 I just posted this week on my blog about sewing a dress for my Mandy doll(now my daughter’s). I was lucky and found a vintage pattern for her. Jenny! We have Mandy and Becky here and they get a lot of love. How fun! My daughter is playing with My Jenny, Mandy, Becky – and my brothers boy – Mikey? This doll looks so cute and I like her cutey hair. So cute, i love your choice of fabric.